Content marketing is one of the primary methods I use to grow my business. But constantly coming up with original content ideas can be a serious challenge. Do I hit the mark with every single article I write? No. But I have figured out some strategies that help me find great topics and create killer headlines, more often than not. This post will outline the main method I use, both when writing new content for my own site, and when coming up with pitches for guest posts on other sites. 1. Find posts that are already performing well on other sites. The first thing you'll want to do is browse through popular sites in your niche and identify their top-performing posts. This will give you a good idea of which topics and themes your audience is actually interested in. There are a couple of ways you can do this. The first is to manually comb through these sites to find out which posts have already proven popular in terms of comments, views, and social shares. 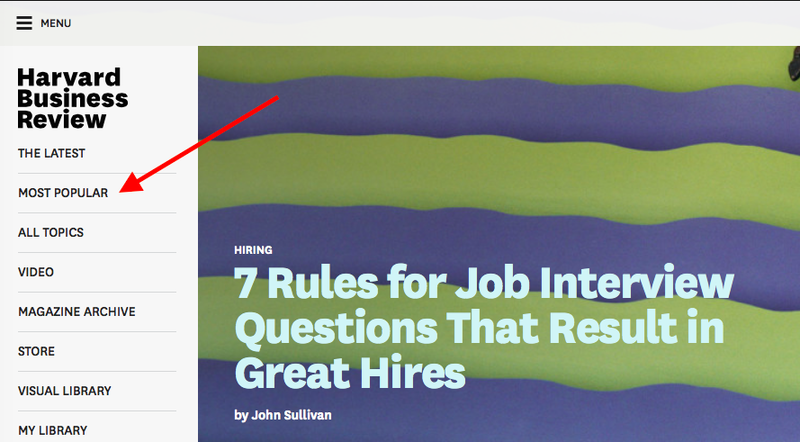 Many sites will have a link or menu option to view the most popular posts, which helps a lot. While this is an effective strategy for finding popular topics on a specific site, it can be time consuming and a bit clumsy. Tools like my friends at Searchmetrics and/or a great tool like BuzzSumo can help streamline the process. And don't worry too much how long it takes at first, you will become faster and faster at finding what you need in your searches. Searchmetrics will help you find the most popular posts and pages on a specific domain. Simply plug in the URL of a popular site in your industry (or even a competitor's site) to see their top-performing content in terms of traffic. BuzzSumo, on the other hand, allows you to find top content, either by domain or by keyword. You can plug in a URL and find the most popular posts on that domain (in terms of social shares); but you can also find out the most popular posts on a certain topic on any domain. Whichever tool you use, the key is to look for a popular topic that would work well in your niche, and that you think you can write about. 2. Identify weaknesses in those posts and then write a better one. Can I add my own voice or opinion to this topic to take the conversation to the next level? Can I cover this topic in more depth and detail than the original author(s)? Can I add elements of interest like infographics, videos or quizzes? How is the on-page SEO of these posts? Are there things I can do to rank higher? A tool like the MozBar SEO plugin can help with this. Keep in mind you're not copying these posts, or even using the same structure for your new content. What you are doing is using them, or an idea you get while reading the post as a jumping off point to create your own, original take on the same topic. Here are 12 additional tips that I put together to help you take your content from good to great. 3. Find popular headlines and turn them into your own "headline template"
An amazing post with a crappy headline is doomed to failure. Your titles don't have to be earth-shattering, but it never hurts to base them off of headlines that have already proven popular. Keep in mind, if people don't click on your title, they will never see the amazing content you posted. Your title should be your main focus. Visit big-name sites like Entrepreneur, BuzzFeed, Huffington Post and The New York Times and browse through their posts. Look for headlines that jump out at you, and that you think you can rework to fit your topic. Keep in mind that you're not looking for posts on the same topic you've chosen, or that are even necessarily relevant to your niche. What you are looking for is an attention-getting headlines that you can use as your own personal headline template. 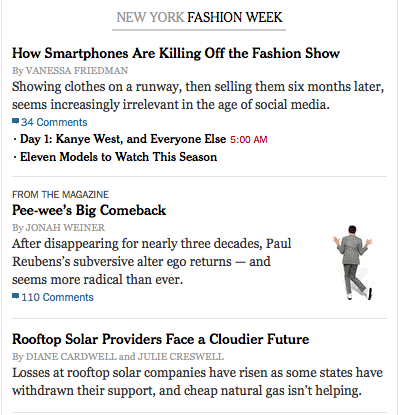 I'm immediately drawn to the first headline, "How Smartphones Are Killing Off the Fashion Show." I typically write about topics related to tech, startups and marketing, so this topic clearly isn't the right fit for me. However, the headline itself could easily be reworked to match up with the topic I've chosen. For instance, if I want to write about something in the tech field, I might rework that title into "How Hackers Are Killing Our Sense of Security Online." The key here isn't to use the actual topic of the headline, only its structure. And the best part is that because you're changing up the title to suit your topic, you can often use this same 'template' to come up with titles for multiple future posts. 4. Write 2 titles for your post, and let someone else choose. Up to this point, you'll have come up with a great topic and post, with a killer headline; or at least you hope it's a killer headline. While you've based your headline on one that's already proven popular, it never hurts to get a second opinion. So here's what you do: For each post you write, come up with at least one alternate title. Now consult with a friend or colleague, giving them the two headline options and asking them which one works best. Ask them to choose the headline that immediately catches their attention - not the post they think others will prefer. Of course, you have the final word on which headline gets used, but sometimes it helps to get a fresh perspective before you decide. Coming up with new content ideas is no joke. Anything you can do to streamline the process of finding popular topics and headlines can help. I hope this post has given you a framework for finding your own killer content ideas! What strategies do you use to find new content ideas? Share with us below!